2012 XTerra World Champion on the bike trail in West Maui. Last weekend the best of the world’s best off-road triathletes competed in the 2012 XTerra World Championship at Kapalua in West Maui. While the 2012 XTerra may be remembered for the Tsunami warnings with evacuations of some of the XTerra athletes, there was plenty of exciting racing action on the XTerra courses too! Being the closest bike shop servicing the XTerra Maui, we were super busy and happy we could supply rental bikes and perform bike repairs when needed!! Fortunately, we had extra bike mechanics on hand and were able to help several racers who had experienced breakdowns requiring bike repairs and adjustments or bike parts. Several bike rentals were used in the race and we were right there for XTerra practice runs and on race day for last second bike adjustments! After you review the 2012 XTerra World Championship results and watch the XTerra Maui highlights video below, read about the TriLanai Triathlon. 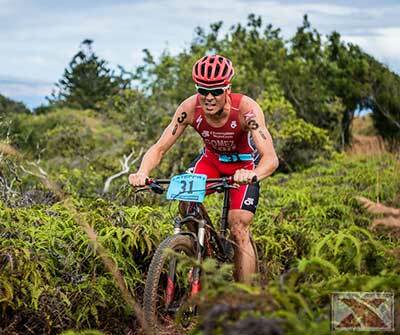 Or, check out more pics from XTerra Maui! The XTerra Maui 2012 winner gets the 20 thousand dollar check at Kapalua in West Maui. Congratulations to the 2012 XTerra World Champion Javier Gomez! Gomez, from Spain and racing in his first XTerra, conquered the combined XTerra course in 2 hours, 26 minutes and 54 seconds! Earning the $20,000 check, Gomez claimed the XTerra World Championship title nearly a full minute ahead of his closest challenger, US XTerra racer Josiah Middaugh. After claiming the XTerra bike course was lame a couple days prior to the race, mountain bike favorite Conrad The Caveman Stolz couldn’t muster better than his third place podium finish. He still seemed happy with his performance the overall finish and who could blame him. We had a blast keeping up with the racing action on the XTerra bike and run course by following along using the GPS trackers and video streams and want to express Thanks to LuckStone.com for sponsoring XTerralive.com! The women's Maui XTerra racing action saw defending XTerra World Champion Lesley Paterson repeat again at the 2012 XTerra in Kapalua. With far less drama than her narrow victory last year, the Scottish triathlete bested Barbara Riveros-Diaz from Chili by more than 4 minutes! Read the 2012 World Championship results press release. The county of Maui hosts the TriLanai triathlon on Maui. The Maui bike action keeps happening this weekend when many of the XTerra athletes and fans head to the Maui County island of Lanai to compete in the TriLanai Triathlon. A little less intense than the prior weekend of Maui XTerra World Championship, the racers and race teams thoroughly enjoy the quiet of Lanai and competing in the slightly less challenging .5 mile swim, 10 mile mountain bike ride and a 3 mile run on the famed Challenge at Manele Golf course. Earlier this week, we took most of the West Maui Cycles bike rental fleet with us across the channel to Lanai. We loaded the performance mountain bikes and cross bikes on the Expeditions Ferry. Along with bike rentals on Lanai, we have mechanics and bicycle parts with our portable bike shop set up for a bike clinic at TriLanai. West Maui Cycles in Lahaina is a sponsor bike shop of TriLanai. Hop on the ferry and catch the action!